Lark is an 11 week old Catahoula/Lab mix. 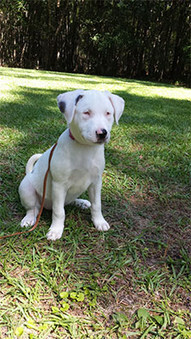 Lark is a very loving pup and is making progress on housebreaking and walking on the leash. She loves all toys and especially loves Bully sticks. She loves walks and to be held. Lark is new to rescue so please look for updates. Lark is looking for her forever home. If you think it could be yours, read more about Adopting from BDRA before submitting your application below. BDRA relies on your donations to rescue blind dogs around the United States. Please consider giving in support of Lark.